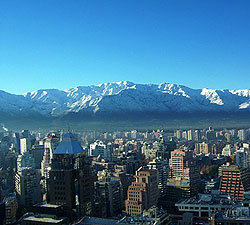 Chile's capital city, Santiago (prime area), is dominated by the vast metropolitan area known as Greater Santiago. With a population of more than 5 million, Santiago is a modern city, with high-rise buildings and suburban housing estates, yet still retaining much of the elegant atmosphere of bygone years. Many locals manage to retain a leisurely pace of life despite the modern bustle of this financial centre. Santiago's historic centre has been vigilantly preserved, constantly undergoing refurbishment and restoration. Santiago has many splendid old churches, the most famous of which is the Iglesia y Convento de San Francisco. There are also beautiful parks, such as the unique Cerro Santa Lucía with its fountains situated among old ruins. Santiago can also be seen as a starting point from which one may begin to explore what Chile has to offer there are ski slopes just a few miles from the city, Pacific beaches just an hour's drive northwest, and vineyards in the south producing world-famous Chilean wines. Santiago has the most modern transportation system in South America, with an ever-expanding underground metro. Its Costanera Norte highway system allows one to drive from the eastern side to the western side of the sprawling city in just 25 minutes. Santiago enjoys a mild Mediterranean climate, with fairly hot dry summers from November to March and cool humid winters from June to August. Winter temperatures can reach near freezing, and the higher altitude suburban areas get some snow, although the entire city rarely experiences snow. Another winter phenomenon is smog. Air, water, and noise pollution are serious problems. There are plans to replace all the diesel-running buses by 2010 and to decontaminate the Mapocho River, which runs through the city. The Barrio Lastarria is a place of extreme contrasts, with cultural attractions and upscale shops around the corner from a red-light district. There are splendid Art Deco buildings bordering the romantic riverside Parque Forestal. The oldest museum in Latin America, the Museo de Bellas Artes, is found in its heart, along with the Academia de Bellas Artes. There are also newer museums, such as the Museo Arqueológico de Santiago and the Museo de Artes Visuales. The Sunday flea market on Calle Lastarria is another popular attraction. Street performers and artists can be seen in the area on weekends as well. There are also some good eateries and great cafés all over the area. Once home to aristocrats and an exclusive neighbourhood in the late 19th and early 20th centuries, Dieciocho and República have become quite rundown in recent years. However, with Chile's growing prosperity, these two neighbourhoods are beginning to reclaim their former glory. Efforts to beautify the area are underway, with the construction of elegant parks and homes. It is a green area, with good universities and museums, a racecourse, and an amusement park. The entire area is officially slated for conservation. Barrio República is the greener of the two districts and is something of a cultural hub, being home to Museo de la Solidaridad Salvador Allende, a contemporary museum housed in a fine mansion. Dieciocho, named for the national holiday (September 18), is a busier neighbourhood than República, is full of old buildings in various stages of disrepair. Many of the better-preserved buildings house institutions and organisations. Barrio Brasil has a quaint atmosphere, with its cobblestoned streets and stately mansions. A thriving district in the 1950s, Barrio Brasil became a derelict neighbourhood after the Norte-Sur highway was built, cutting it off from the historic centre. Recently renovated, this area is now a trendy neighbourhood. The hum of family life can be heard from every home, combining with the buzz of activity on the streets there are lively contemporary establishments amidst traditional Art Nouveau mansions, the Gothic Basílica del Salvador, and the Art Deco Basilica de la Virgen de Lourdes. Many upscale bars, restaurants, and shops can be found in Barrio Brasil. Plaza Brasil is a busy area, full of children at play during the day and gathering teenagers at night. Bordering it is Santiago's oldest public park, the Quinta Normal, which doesn't have much to offer when it comes to greenery, but is home to a number of fascinating museums, including the Museo de Historia Natural and the interactive children's museum, the Artequín, housed in a late 19th century glass pavilion.